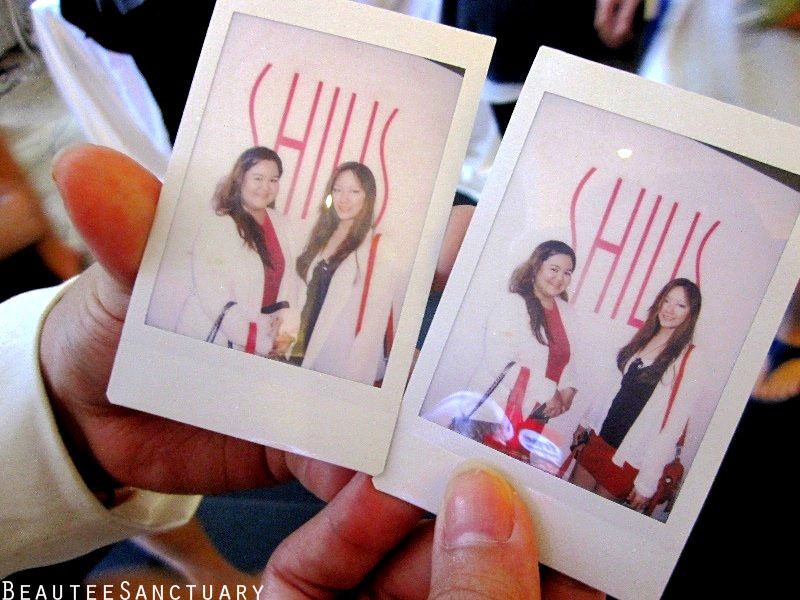 It was a great opportunity to be able to attend the launch of Shills Damascus Rose Skincare series because I love ROSE! I'm a big big sucker for Lavender, second is Rose, so yeah. 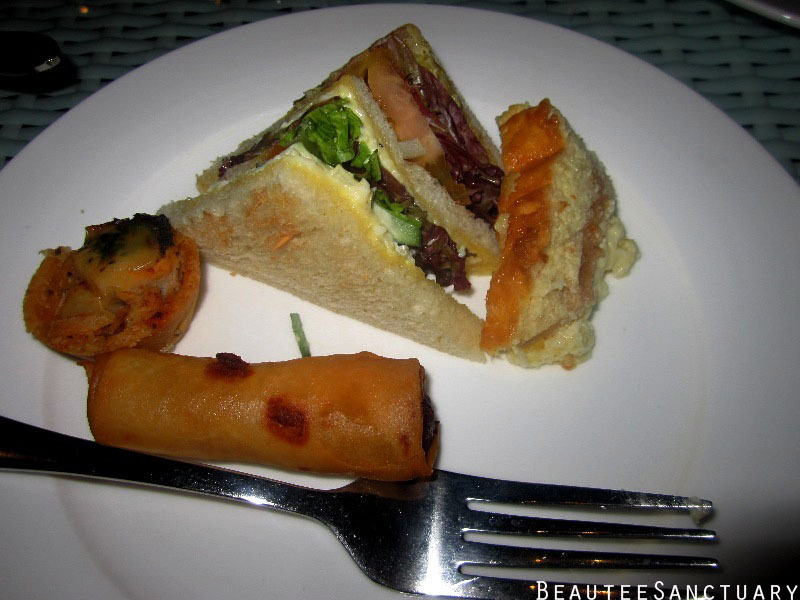 :) The launch was located at Garden Cafe between Midvalley and Gardens, (near the IT section). The theme was White and Pink, but I just came back from PD and Langkawi on the 3rd so I did not have many choices in terms of clothing. I just slipped on a white chiffon cardigan. 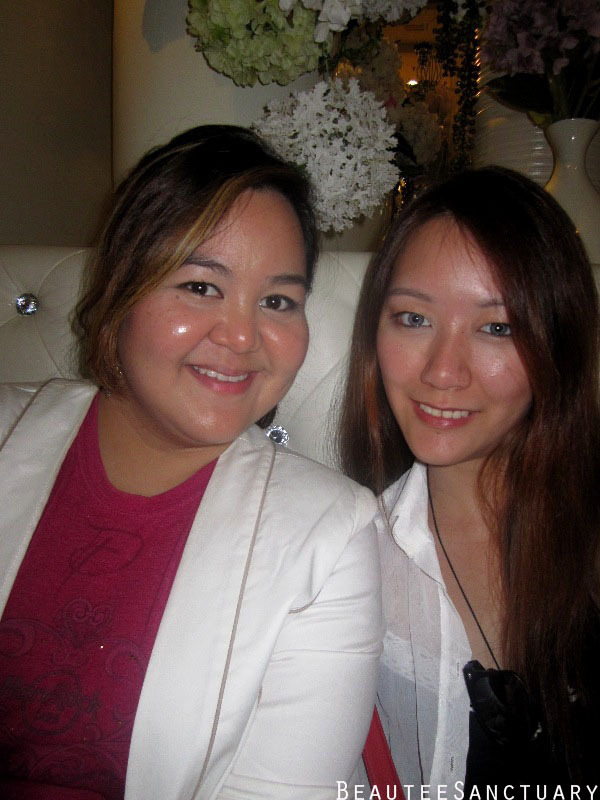 I dragged Lina along because she loves beauty stuff too! 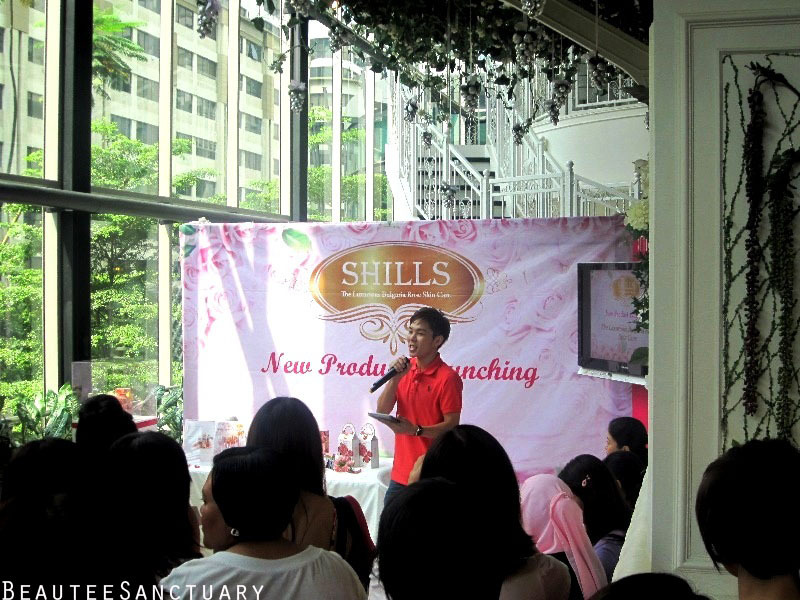 If you have not heard of SHILLS, they were founded in 2009, and are the sole authorized distributor (Shills Beauty Sdn Bhd) of Taiwan's well known skincare and cosmetic brands, SHILLS, ANOSE and DOT DOT in Malaysia. The scent of these products are pretty strong for some and decent for others. 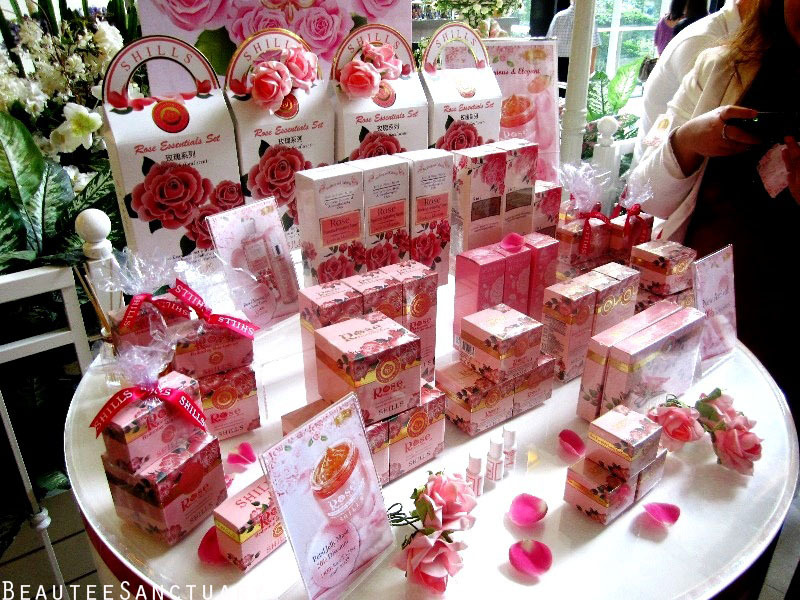 But what I love about the Damascus Rose Skincare Series is that the scent of Rose is very natural. I've smelled so many scented products from stores, whether they are candles or oil, they usually smell a little off and sometimes they contain that chemical kind of scent. Whereas for SHILLS, the Rose scent is pretty natural. "This rose essential oil is represents the symbol of love and beauty, the Damascus Rose is renowned for its fine fragrance and rose essential oil used in making perfumery and rose water which are safe for human consumption. This precious rose species are cultivated from the Valley of Rose that fine grows at Bulgaria Mountain, an altitude between 300 and 1200m." The launch begin with a performance by cute little girls dancing, I was way at the back so i could not really see or snap a proper picture of it. Later on Eva who was introduced by the Emcee, showed a demonstration on how to apply products on face, also the benefit of the products. She started of by measuring the percentage of moisture on the model for that day. The meter shows 33.2, which according to Eva is a little on the low side. 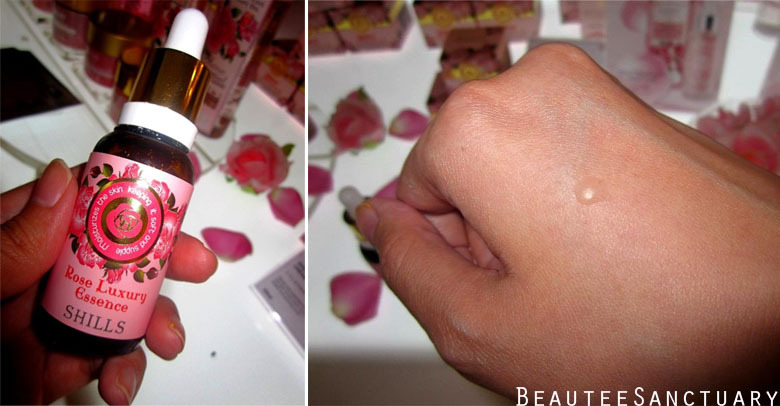 In this picture she demonstrated on how to apply the Rose Luxury Essence, RM99/30ml. She explained that the way to apply is outwards and upwards, whereas for the forehead, from the center to the side. 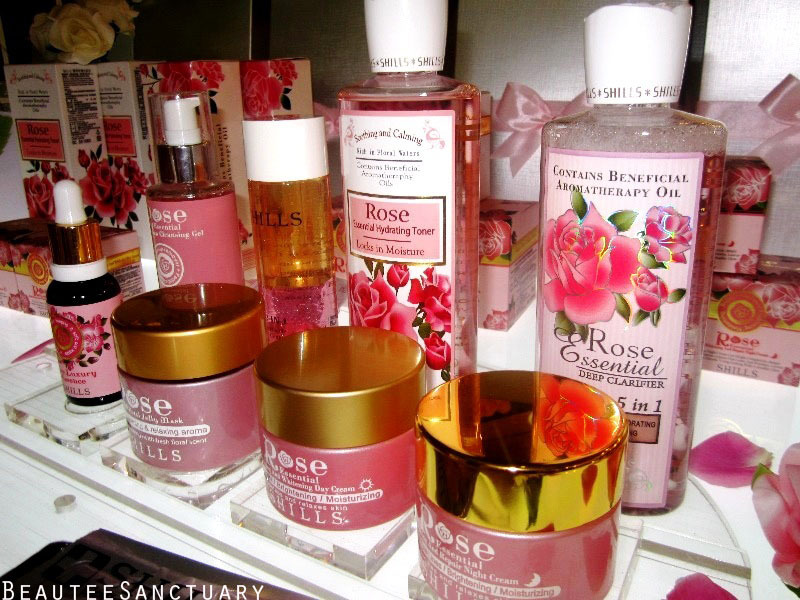 Rose Luxury Essence is specially made of Bulgaria's natural roses to improve dull-looking skin and slows down skin aging to keep the skin fully hydrated throughout the day. 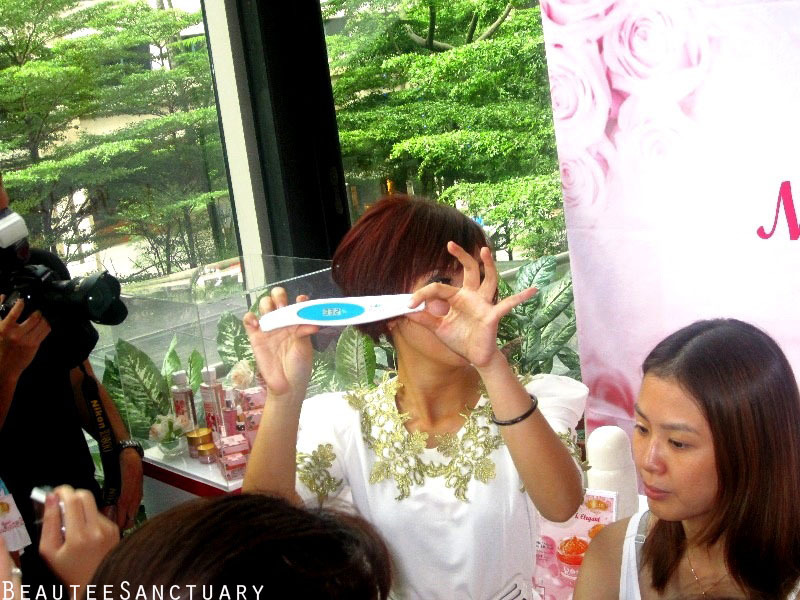 In this picture, Eva is using the Rose Essential Dual Action Cleansing Gel. Its texture is gel based but as you rub around your skin the texture would get a little glue-ee. Eva shared that after using the eye mask, you can soak them in hot water, and later on can be used while bathing in the bathtub, as it contains ingredients that are good for the skin. While looking at the products at the counter, Eva personally came and spoke to me. I told her that I have oily skin. But she pointed out that only my skin is oily, but my pores are dry. According to her the reason why my skin feels oily is because my pores are dry, so my body would naturally produce more oil to compensate the dryness in my pores. 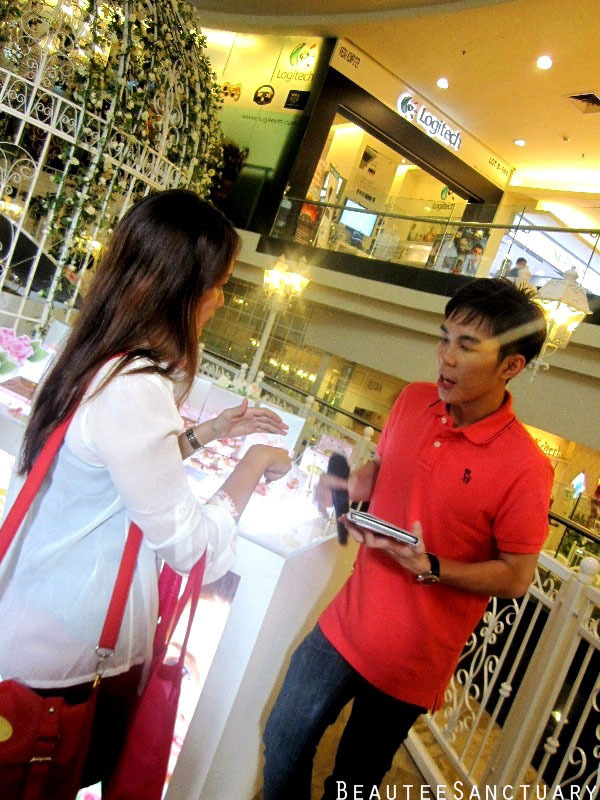 While testing out the products, I was later approached by the emcee to do a short interview regarding the products. My favourite product of all would be the Dual Cleansing Gel because it is very unique and so far I've not seen products like that. The launch ended with some yummy Tea Time snacks! They were quite good. Remember that even if you have oily skin, it is necessary to apply moisturizer to prevent our skin from aging faster. The two things that I know of that causes aging is the sun (remember to wear your facial sun screen), and dry skin. I know there are some people with really dry skin that the most moisturizing product does not help. Those with very dry skin have to find the product that's suitable for your skin. For more information on their products please visit their Facebook page HERE. 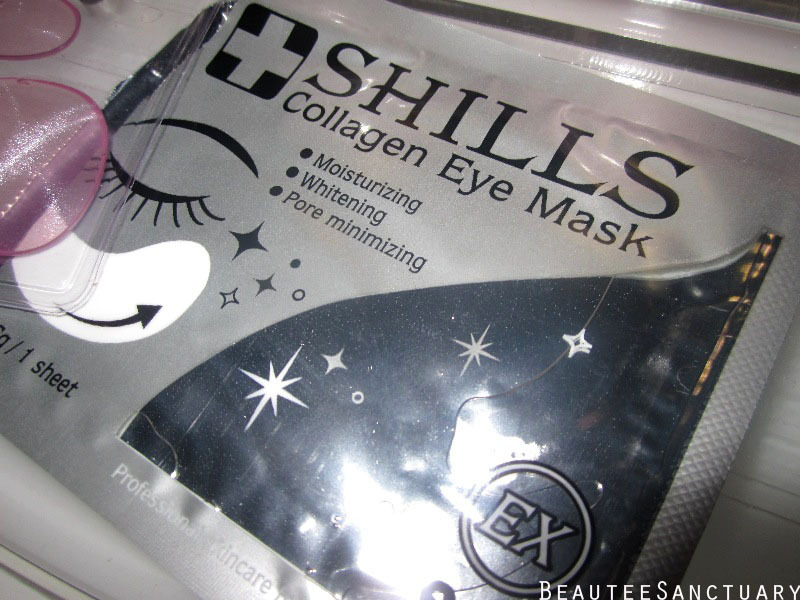 SHILLS can be found at Cheras Leisure Mall, Berjaya Time Square, Stardust Studio Fahrenheit 88, Aeon Rawang, Penang Queensbay Mall, Tesco Kepong Village Mall, Dataran Pahlawan Malacca, Aeon Big Rivercity, Sutera Mall Johor Bahru, Johor Bahru City Square and ALL SASA Shops. so many good stuff to try on. 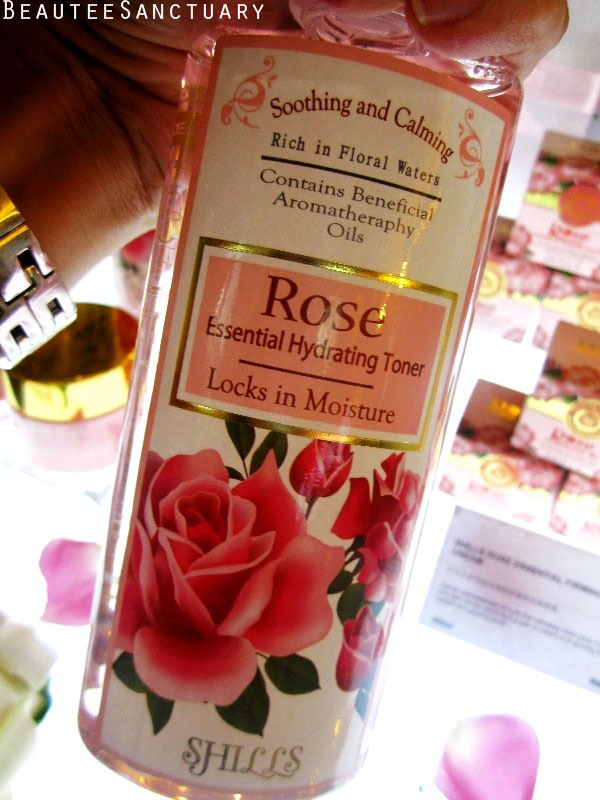 i personally love the Rose Luxury Essence. by the way, followed ur blog.